They say no two people are the same and that can also apply to your mattress needs. Zip Link mattresses are the perfect solution if you and your partner prefer or need different support or types of mattress. 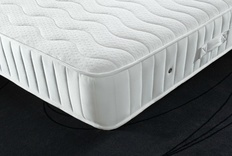 Our Zip Link mattresses allow you to pick the ideal mattress tensions on each side of the bed and combine these into a mattress suitable for superking and emperor bed sizes. Zip link mattresses are also great for zip and link beds that split into two single beds and often used in hotels and guesthouses offering flexibility of use. Mattress tensions available are medium, firm and extra firm. As each side of the mattress is independent of the other, this eliminates roll together and gives couples of differing size, weight or medical needs such as sore backs to choose the mattress tension that best suits them rather than compromise on comfort. If access to your bedroom is tight or limited, the zip link mattress is also a solution where stairs and landings have to be negotiated and in many instances not suitable for access of superking and emperor size mattresses.